ChiroFusion is ideal for chiropractic practices looking for full-featured web-based chiropractic software with a low monthly fee. ChiroFusion is a 100% web-based chiropractic practice management software, geared towards practices looking for a value-oriented solution without any additional bells and whistles. Is ChiroFusion the right software for you? ChiroFusion is one of few web-based solutions on the market designed specifically for chiropractors, and has a sleek, modern UI compared to its competitors. Given its low price point and low startup costs compared to other solutions, ChiroFusion is easy to try, and is a great introductory software for offices looking to explore chiropractic management software solutions. More modern-looking UI than many of its competitors. Smaller company, makes iterating on software slower. Founded in 2012, ChiroFusion is a modern web-based HIPAA-compliant chiropractic EHR software solution designed specifically for chiropractors. We like that ChiroFusion is one of the few web-based solutions on the market, whereas most of its older competitors require local software installations. Being web-based allows you to avoid having to deal with hassles that typically come with local software installations, such as managing software upgrades, and backing up data. We also like that ChiroFusion has a low startup cost, and charges a low recurring monthly fee -- this makes it easy to try the software, and makes it appropriate for smaller practices looking to experiment with chiropractic EHR solutions. The software is lightweight, which makes it have a low learning curve and easy to use. Below, we discuss the key features of ChiroFusion, and how they can benefit your practice. 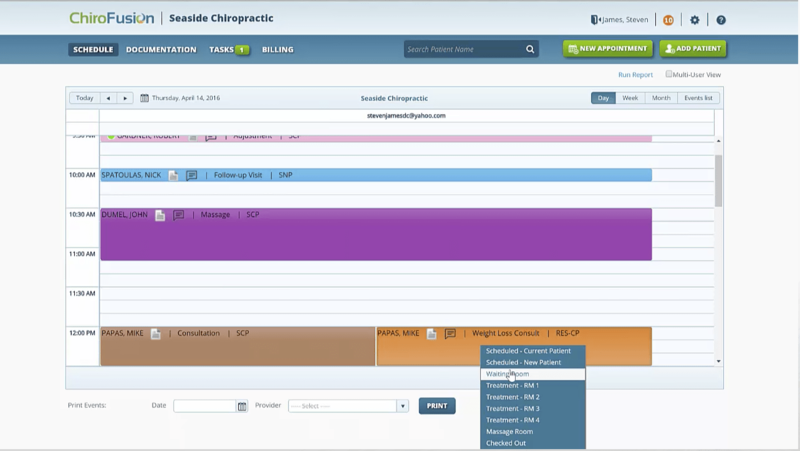 ChiroFusion offers a more modern and sleek scheduling UI compared to its competitors. 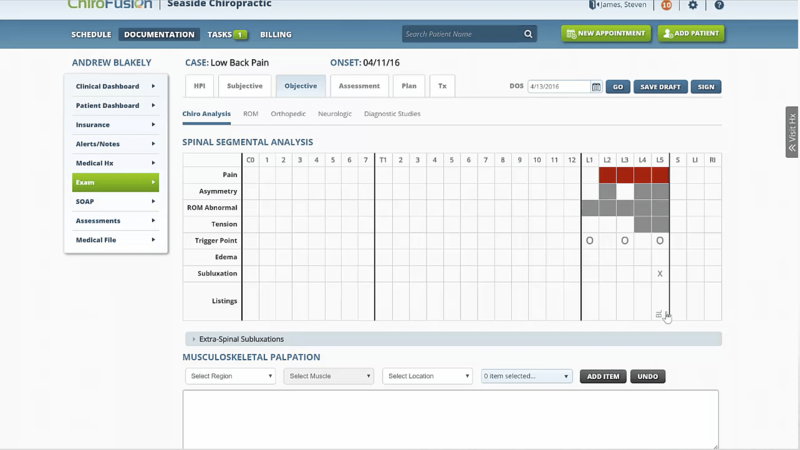 The scheduler enables users to color code appointments by doctor or treatment type. Users can also track patients as they get sent to different locations within your office, by using a dropdown menu to select where the patient currently is. This enables doctors to reduce wait times, and make sure that resources/rooms are being utilized optimally. Another nice feature the software provides is the ability to send automated appointment reminders through email or text message. This feature helps reduce cancellations and no-shows. When the patient is sent a reminder, if they confirm the appointment, then the scheduler will update with a green circle. If they reject the appointment, there will be a red circle next to their name. This makes it easy to quickly identify your confirmed bookings for the day, and lets you know the patients who are at risk of not showing. Since ChiroFusion was designed specifically for chiropractors, its documentation capabilities are exceptionally strong for chiropractors. 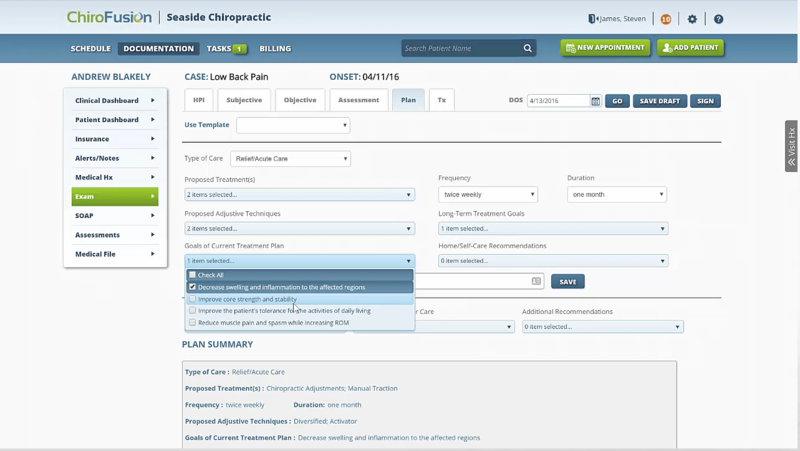 As with its scheduler, the documentation section is very intuitive and easy to use, and offers a lot of documentation capabilities specific to chiropractors. 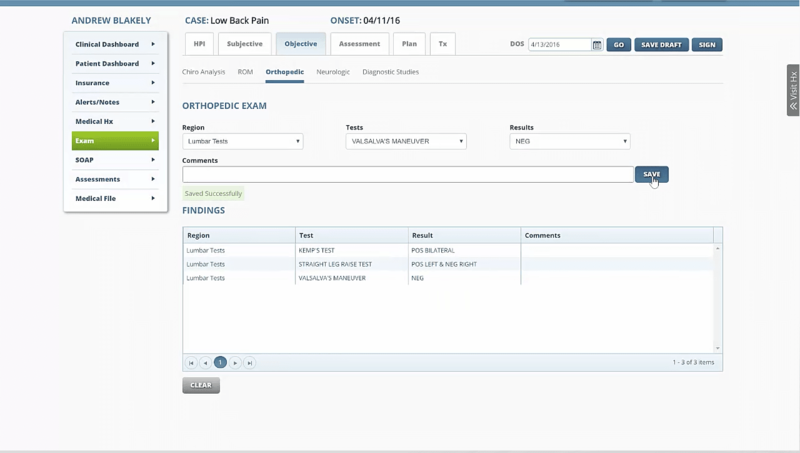 For example, the Spinal Segmmental Analysis form allows users to describe the patient’s painpoints with just a few clicks. 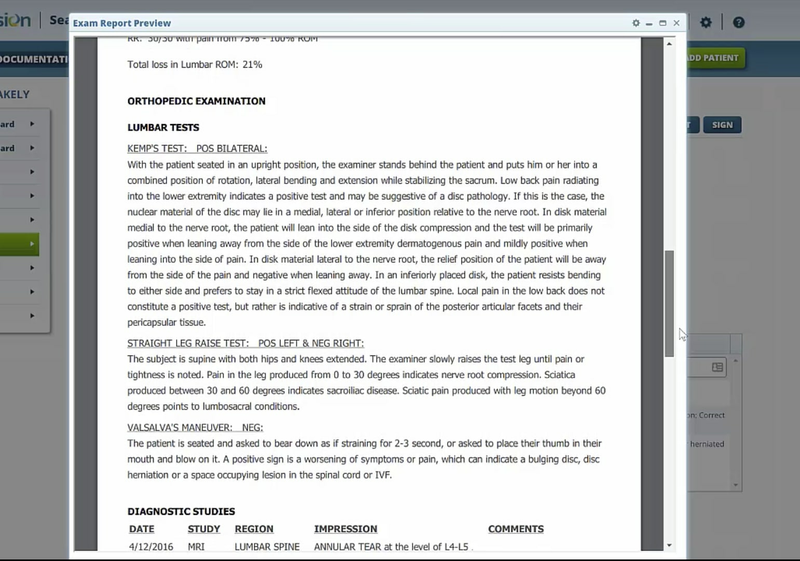 Here’s a screenshot which shows how you can report the findings of all your tests for the patient. Chirofusion also makes it easy to create a customized plan of care. By selecting a few checkboxes from the dropdown menu, you can quickly select patient objectives and proposed treatments. The software will then take that information and automatically generate a plan of care template, which can then be used for other patients who are experiencing similar symptoms. The software will also calculate the number of treatments required for this plan of care, and generate a plan summary, as shown below. Once a patient’s profile has been filled out, generating subsequent daily SOAP notes for each visit is fast -- all you have to do is make the relevant updates. ChiroFusion claims that on average, it takes 30 seconds to generate daily SOAP notes. Whenever you sign a daily SOAP note using ChiroFusion, you have the option of sending it to billing, and the amount billed will be based off of the treatment codes in the generated report. The software enables users to send submit free electronic claims to over 1,700 payers and also track the status of each claim in an easy to read dashboard. 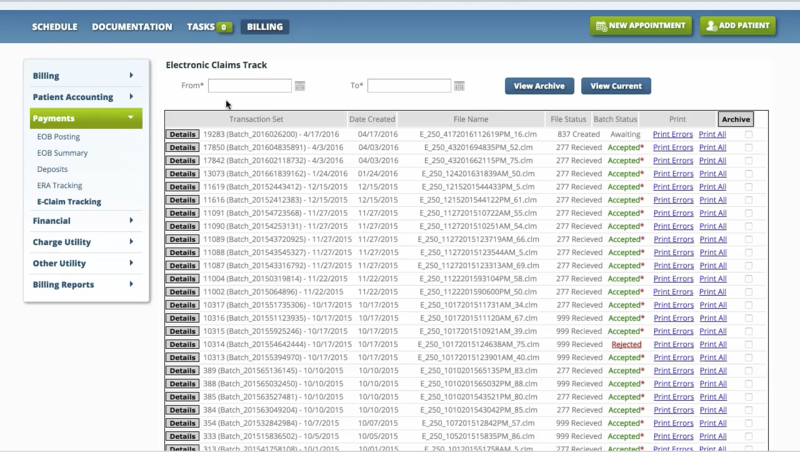 The dashboard keeps track of each claim sent out, and monitors the status, making it easy to find the rejected or unprocessed claims. Here’s an example of a billing claim generated by the software. 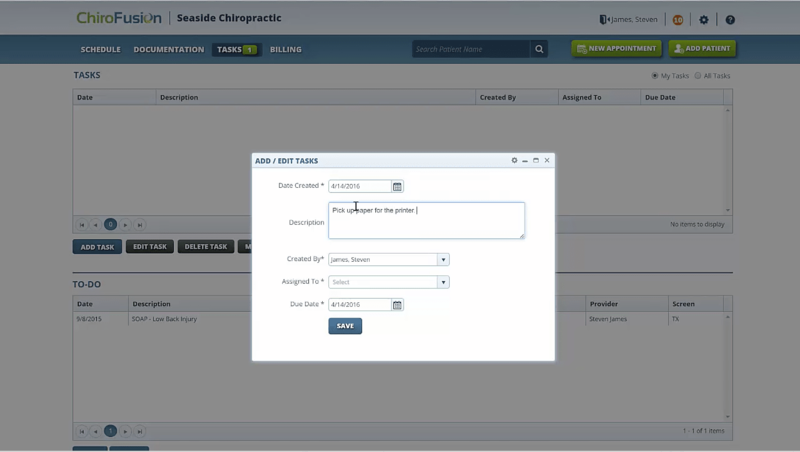 In addition to the billing dashboard, there are other reports you can generate with ChiroFusion. We’ve found its reports to be good at answering basic questions like “how much revenue am I generating from a specific insurance provider”, or “how many no-shows have I had over the past month?” However, beyond these simple kinds of questions, you will have to export the data to excel and generate your own custom reports. 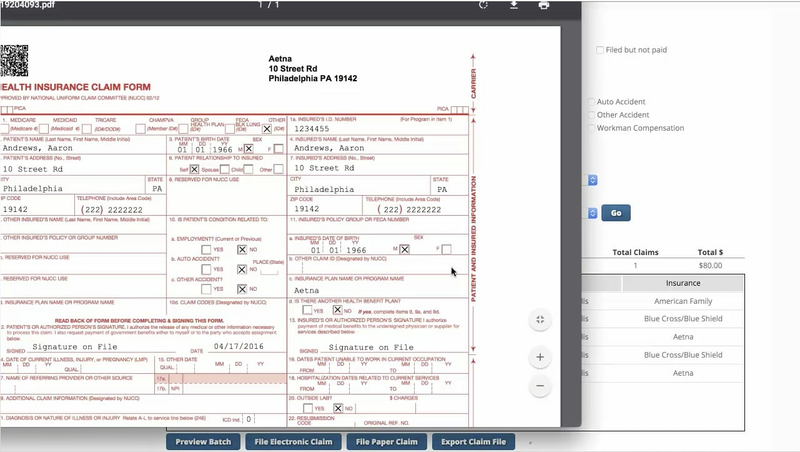 Though not a primary strength of ChiroFusion, the software has task management capabilities, which enable you to create and assign tasks to employees, and specify a due date. This is meant to help manage administrative and clinical tasks, and make your business run more smoothly. The task management capabilities include real-time notifications to let you know when a new task has been assigned to you, or when a task has been completed. If you are looking for an affordable, web-based chiropractic management solution designed specifically for chiropractors, then we believe that ChiroFusion is the best solution on the market. Whereas most of its competitors require a local software installation and have a high startup price, ChiroFusion has a low startup cost and a low recurring monthly fees, which makes it easy to try. ChiroFusion is designed specifically for chiropractors, so is designed specifically for chiropractic offices who are looking to spend less time on their documentation. The main negative to ChiroFusion is that it’s a smaller company, which can mean that improvements to the software can be slow. However, given its low price point, it’s worth giving it a trial run to see if it’s right for your chiropractic practice.